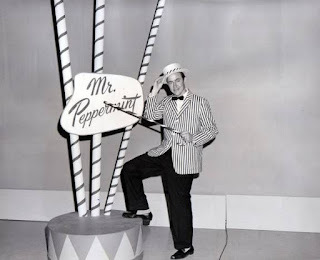 If you grew up on the DFW area during a certain time then you were no stranger to the red and white stripes of television personality Mr. Peppermint. 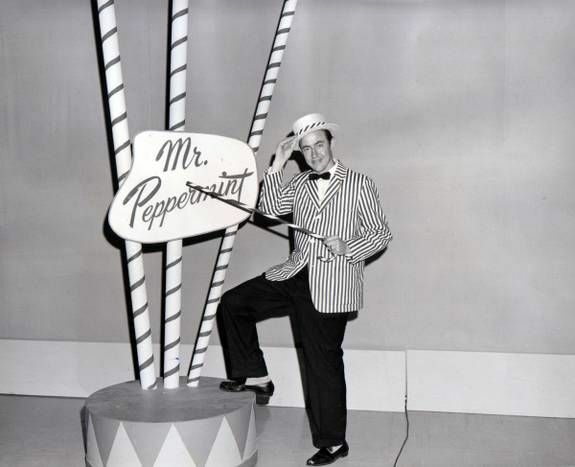 He hosted the kid's show Peppermint Place for decades and helped entertain and educate generations of kids. The minty fresh TV personality was portrayed by Dallas native Jerry Haynes. His TV persona was so strong and beloved that some started to think of him and Mr. Peppermint as one and the same. 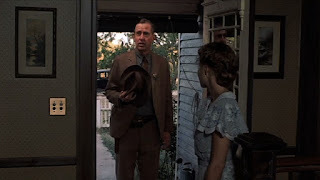 But Haynes was a very talented and prolific actor and appeared in a number of TV and film projects. Today we'll take a look at some of his work in some high profile projects. If you were a north Texas based actor in the late 70s to late 80s then odds are you had a run in with the Ewing clan on the popular series "Dallas." 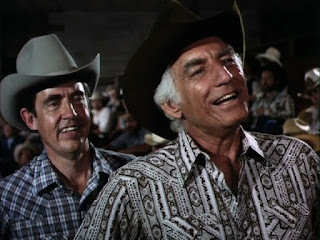 Haynes (on the left) actually appeared in a handful of Dallas episodes as "Pat Powers" but I picked this episode because his scenes feature the Fort Worth Stockyards. 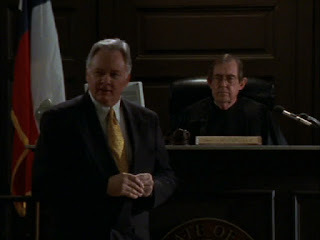 Haynes plays the role of Deputy Jack Driscoll in the award winning film (seen above with Sally Field). A lot of the movie was shot on location in Waxahachie but since it's a period piece, it's difficult to track down specific locations...but I'm still in the process of trying. Most Dallas residents know that the classic scifi film was shot in Dallas (throughout the movie you can spot Reunion Tower in the background of "Future Detroit"). I mentioned before that Dallas City Hall is featured prominently. 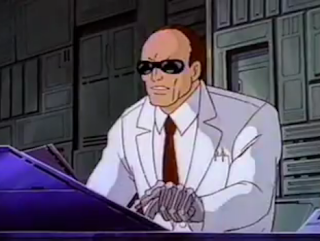 He seemed to go through some changes like giving himself robot arms (or whatever) but the worst change to the character was that he was not voiced by Haynes. I guess he had moved on from the role. Some roles are easier than others. In this two-part sweeps episode of Dr. Quinn Haynes plays a corpse. You might think it's not worth mentioning but that show was a pretty big hit in its time. And, hey, a gig's a gig, right? 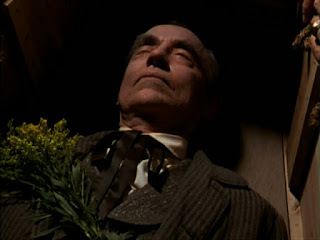 And that's why you don't want to get involved with the mob. 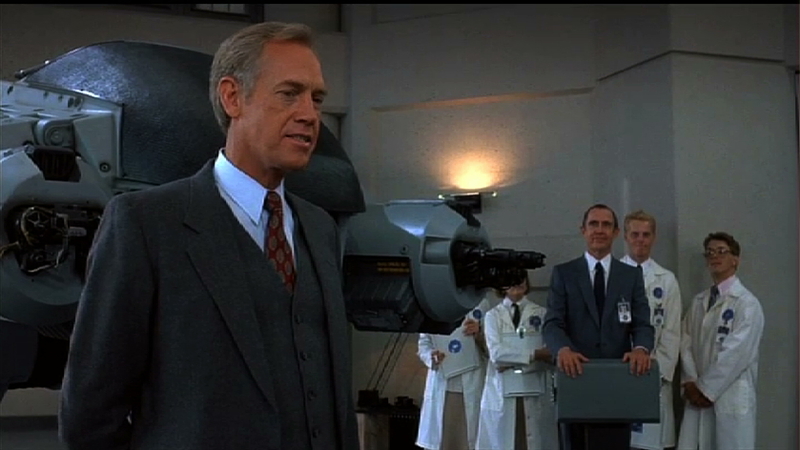 Don't worry though, I'm sure the Rangers will avenge him. Haynes' IMDb page is filled with many other roles. These are just a few of my favorites. And, honestly, these have a lot more death and carnage than I expected from Mr. Peppermint. So you never know when an old friend from the past will surprise you.